In the tradition of Jodi Picoult, Jamie Kain’s The Good Sister begins with pieces of a story that are brought together with increasing momentum and culminates into a poignant ending. A previously perfect-from-the-outside family unit of five – Sarah, Rachel, Asha, and their parents – starts breaking apart after Sarah’s cancer diagnosis. With an absent father and an absent-minded mother, the three sisters have no one to turn to but each other. Sarah’s salvation came in the form of Asha being a bone marrow match, at the cost of pushing Rachel deeper into the void that can be the role of the middle sister. Even Sarah and Asha’s strong bond is infected by the poison of Rachel’s resentment. Seemingly inconsequential actions contribute to Sarah’s demise, and her death forces the surviving members of her family to consider more closely the aftermath of both her cancer survival and her tragic death. For there is something quite bitter about a double cancer survivor dying accidentally at a young age, when her future seemed to bright. 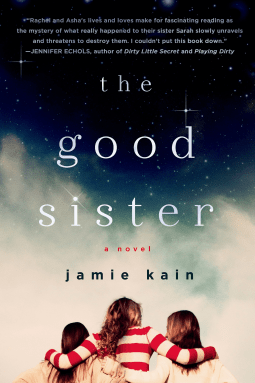 The Good Sister features three major strengths: the skillful storytelling, the in-depth character development, and the reflections on two major topics that are important to me: life after death, and the nature of family bonds. As previously mentioned, Jamie Kain expertly weaved a story by telling it through three point of views, that of each sister. This allows for the story to gain depth and layering which adds great complexity. The only weakness I found was near the middle of the book, when Sarah’s story started dragging. At first tantalizing, the chapters featuring her point of view became frustrating as the author dragged out a conclusion I had by then figured out. Kain simultaneously and tenaciously delved into the character of Sarah, Rachel, and Asha. She used two tools quite powerfully. The first was the insight the reader got by reading the thoughts and seeing the same reality through the eyes of each of the three sisters. The second was the insight the reader got into each character through the way they are seen by their two sisters. As anyone who has a sibling knows, these tend to have both the most insight on us, as well as the most love and criticism – and an interesting combination of compassion and cruelty. The topics of life after death and the nature of family bonds were two obvious choices for Kain to delve into, and she manages to do so quite expertly, weaving it naturally and seamlessly into the plot of the story. Life after death is defined in the Christian way: heaven, hell, and purgatory, and reaping the consequences of one’s actions, intentional or not. Family bonds are explored in a straightforward way that initially came as a shock, but turned out to be refreshingly honest while at the same time hopeful. The book is raw and arresting; not only will it keep you reading well into the night, it will also keep you thinking well into the night. Featuring an incredible depth of character development that reflects a deep understanding of the unique relationship between sisters, The Good Sister is a poignant read that will make you reach for the phone and check in on your sibling – because, as Sarah, Rachel, and Asha discover, life is precious and each moment counts. First published on Sahar’s Blog on 20 July 2014. I’m always curious to know how a writer is able to create such complex characters and personalities in a book, where they get their inspiration from and how their thought-process evolves into the final product of each of the characters in the plot. Will definitely pick up this book when I find the courage to get through it! Thanks for the great review.